In 1960 19 year old Herman Goelitz Rowland, Sr., a fourth generation candy maker took over the family candy business. The times were lean for his family's Californian business which was best known for making candy corn. In a leap of faith that boggles the mind today, Herm and his family decided not to close the doors, but to expand and begin making jelly beans, Chocolate Dutch Mints, gummi bears, and jells. Giant jelly beans, regular jelly beans, miniature jelly beans, all sorts of styles were pouring out of the candy factory! The extra touch that became a signature for the company were jelly beans with flavours cooked into the centre and in the shells using the very best ingredients regardless of cost - in short; terrific tasting jelly beans! In 1967 some of those beans managed to catch the attention of the Governor of California, Ronald Reagan. Throughout his two terms in office, the Governor ate Herm's jelly beans and ultimately wrote that famous letter saying "we can hardly start a meeting or make a decision without passing around the jar of jelly beans." Now the fabulous scents of Jelly Belly are available for your car! 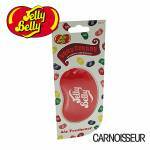 We stock a selection of our favourite Jelly Belly Air Fresheners for you to choose from.